I have always thought it sounded trite to speak of “falling in love with Jesus.” But trite or not, isn’t that what I want for my children? To learn to “love the LORD your God with all your heart and with all your soul and with all your might” (Deuteronomy 6:5). 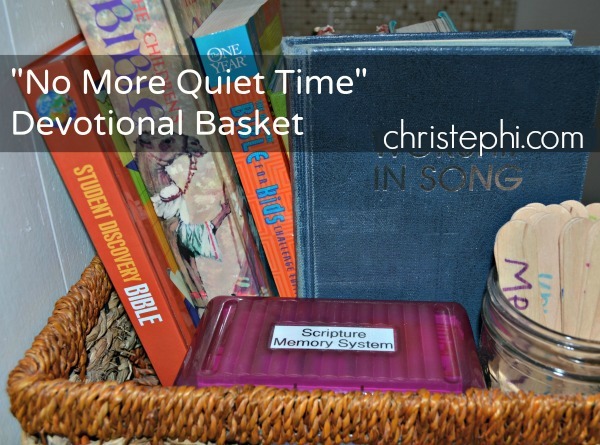 With that in mind, and having run across this blog post on Pinterest several months ago, I created a morning devotion basket for the kids and I to use. You see, up till now, I would typically find time to read the Bible and pray away from my children. Away from distraction, away from the demands of dust and dirty dishes, and away from the 437 questions a four-year-old asks every day. Then I realized I was doing them a major disservice by disallowing them to see me in the Word regularly. If I want them to love the Lord God, then I must show them how I love the Lord my God! The Children's Bible — This was my husband’s when he was a boy. I love the detailed artwork (in spite of the blue-eyed, blond-haired Jesus). It’s much more appealing than the cartoony artwork you often find in children’s Bibles. 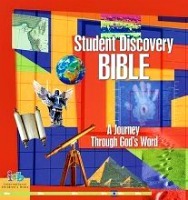 Student Discovery Bible — Like The Children’s Bible, this is not a full-text Bible. Instead, it contains all the major stories of the Bible, but in a condensed format. It also has many side notes and facts that pertain to the life & times of the people in the Bible. The One Year Bible for Kids — This Bible has been divided up into 365 readings, short enough for kids to get through in just a few minutes. While it doesn’t include every chapter and verse, it goes through the entire Bible from Genesis to Revelation. Each day’s reading includes Biblical text and a tiny focus paragraph to relate the reading to the child’s life, and back to Christ, too! I like that the readings are more Bible and less object lesson. 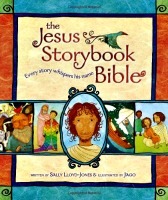 Jesus Storybook Bible — This widely popular title is a dramatic read that relates every story back to Jesus. 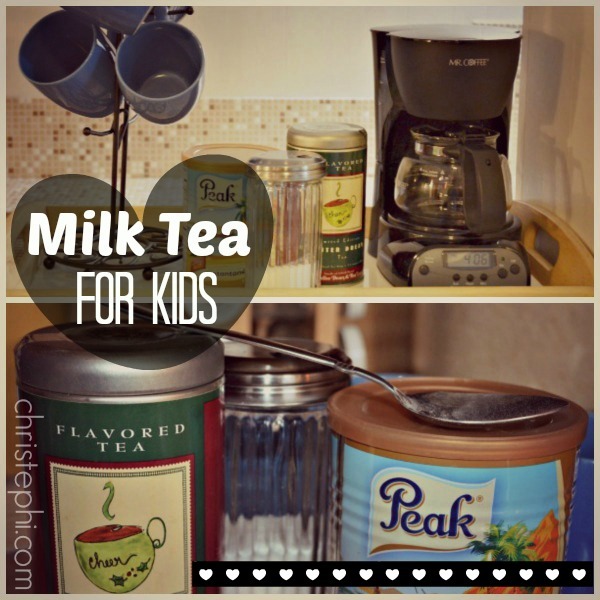 In spite of its popularity, my kids don’t seem to like it any better than any of the others. The artwork is very pretty, but we still prefer the realistic art to the cartoony stuff. International Children’s Bible — Here we finally have a full-text Bible, a complete translation that is accessible to kids. I prefer this translation over the NIrV for early elementary readers. Proverbs for Kids from THE Book — It took me years to track down this book! That was mainly because I couldn’t remember its title. It is no longer in print, but used copies are available. It brings the wisdom in the Proverbs to life in amusing and memorable ways and opens the doors to conversation about right and wrong for the whole family! My First Bible in Pictures by Kenneth Taylor — I adore the artwork in this sweet little picture Bible. The stories are told in simple language and the pictures are a feast for the eyes. You wouldn’t want this to be your only Bible or Bible storybook because the text assumes the child has a certain familiarity with the stores already, but we find it a wonderful addition to our devotion time. I also have our Scripture Memory Box (ours is like this one) and a jar of prayer sticks with the names of all our family and friends written on them. The final item is my favorite hymnal. Make a quick pot of tea. Our favorite is Winter Dream from Coffee Bean. Update: since Winter Dream is discontinued, our new favorites are Harney & Sons teas. They can be found on Amazon or at Target. Spoon 2 large scoops of powdered milk into the bottom of a mug. Fill the cup about 3/4 full with tea. Top off the cup with cold water so as not to burn little tongues and give it one last stir. Do we get this done every day? No! In a perfect world, perhaps. But — hear me now — it is not essential to have a perfect track record. You know you’re busy, I know you’re busy, and most important of all God knows you are busy. And we’re not talking college-student-finals-are-coming busy. We’re talking about the life and well-being of another human (or multiple humans) is entirely dependent on you! Sometimes you don’t have the choice between sitting down for 20 minutes and tending to your little one’s needs. The little one takes priority. Every time. So give yourself a little grace and remember that it is not essential to have a perfect daily devotion track record. What is essential is to show your children that spending time with the Lord is important. So make it fun, but keep it simple. And don’t be afraid to abandon the idea of “quiet time” in favor of a rather raucous gathering of the tiny disciples in your care. This article was originally published in February 2015 by Home & School Mosaics.